The Vertex Aletheia DACs will be absorbed into the new Quiescent range and re-housed in their acoustically sophisticated casework. The design concepts discussed below are directly relevant to the Quiescent DAC whose performance will be at an even higher level. The Vertex AQ Aletheia dac-1 is unusual in having no upsampling or noise-shaping in its design. A research programme – the Measurement Initiative – with one of the MoD’s research agencies showed that such processing can break up the musical flow. Indeed, the algorithms programmed into sophisticated high-speed chips used, for instance, for upsampling, are prone to mistakes and have to introduce their own ‘guesses’ to correct the checksums. We hear those glitches, an edgy, unnatural sound. The damage becomes more and more unpleasant as energy and complexity increase in the recording, as more guesses are introduced. More below. The Vertex approach is to use a fundamentally simple chip with minimal processing and then to apply the extensive RFI* and EMI* technology that they have developed over more than 20 years, right in the heart of the DAC onto vulnerable individual components. Even greater care is taken with the dac-1.5, using expensive, exotic components throughout the design and implementing vibration and RFI absorption even more comprehensively. The sound of both DACs is rich, vibrant, incisive yet smooth, without a hint of treble grain. Most importantly, as musical complexity builds, it remains incredibly easy to follow – bathing the listener in a dazzling display of musical interplay and emotion. The presentation is also incredibly transparent – the DACs regularly revealing new sounds in even the most familiar recordings. The dac-1 received a glowing report in the magazine hifi+ where Alan Sircom realised that it has actually affected his appreciation of music – almost re-wired his brain. After the DAC had been returned he realised: “This was mourning for the loss of music. That’s how far under your skin the Aletheia gets and I can think of no recommendation higher than that.” Read the full review. The very experienced reviewer Paul Messenger also wrote enthusiastically in HIFICRITIC about his time with the dac-1 and discussed the significance of different CD transports. More information here and how well the dac-1 scored against the competition. Humans are very sensitive to timing – a primeval survival skill – and are subconsciously unsettled if music timing is disturbed. Vertex’s research with the MoD’s Acuity agency has revealed what they describe as “tracking errors” with many music systems, where the equipment fails to follow rapid changes in the music. Think of a heavy lorry (the whole system) compared with an agile sports car (the music signal), each driving fast on a twisting country road. At every bend the lorry is sluggish, tends to overshoot and is slow to recover, while the sports car will confidently jink and dive and be both more precise and much faster. Read the full report. The diagram on P.7 shows graphically how the input signal (green) and the system response (red) diverge is too slow to follow the music signal. The error becomes increasingly obvious as music – such as heavy Rock or dense orchestral music – builds in complexity and volume, creating more damaging acoustic energy to be carried around the system. Listeners are disturbed by the damaged timing, crucial to enjoyment of music, but often miss the cause and try to cure the problem by upgrading equipment. It’s easy to understand how vibration will increase as everything works harder, especially the speakers, and how absorption treatment can be so important. Listeners might all too easily fall into the trap of buying more powerful amplifiers (with bigger vibrating transformers!) in a bid “to control the speakers”. Oh dear. 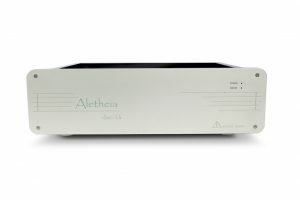 The Aletheia DACs employ 16 bit D-to-A conversion with no oversampling, to reduce processing complexity, and have no noise shaping or filtering, to avoid possible phase shifting, filter ringing and break-down of signal integrity. The DACs are deliberately very basic in processing terms, with the majority of the design effort – right down to a component-by-component level – focused on reducing those interactions that plague systems. There is extensive RFI and microphony reduction throughout the designs, more in the dac-1.5, and an ultra high-quality, dual-stage power supply topology is used. Analogue output is passive, thus avoiding active output stages and output capacitors are Mundorf Supreme (silver/gold in oil) and Duelund solid copper foil CAST in the dac-1.5. An example of the quality of the internal components is that the power supply is filtered with the equivalent of a Vertex HiRez Jaya shunt filter that alone costs over £1000 as an external plug-in mains cleaner. Rear view: Input and output socket panels, isolated from the chassis, SPDIF and Optical inputs on the right, RCA single-ended and XLR balanced outputs on the left. Switches toggle between the inputs and outputs and turn front panel LEDs on/off. Quite apart from the care taken with the internal components, another sign of the thought that has gone into the DACs is that the input and output sockets are mounted on isolated panels that reduce acoustic energy input to the circuitry from the rest of the system. Digital sources can be conventional 16bit/44.1kHz SPDIF signals into the RCA or BNC sockets, or up to 96kHz signals into the TOSLINK optical socket. Outputs are both single-ended RCA and XLR balanced. Read a detailed description of the design ideas and the refined Vertex technology that is built into these highly unusual DACs in the Aletheia handbook and more information on the design and specifications Vertex DACs. Buying: You can order Quiescent and Vertex products direct from their web site while we can offer advice, demonstrations and home loans. Please contact us for advice. Why Aletheia? The Wikipedia entry reads: ‘disclosure’ or ‘truth’. The literal meaning of the word ἀ–λήθεια is ‘the state of not being hidden; the state of being evident’ and it also implies sincerity, as well as factuality or reality.